A garden wedding provides a beautiful backdrop. A garden wedding design filled with creative ideas addresses the type of garden venue and time of year. A romantic or whimsical garden wedding are just a couple of choices to consider while exploring different types of gardens. A garden wedding can be romantic, playful, magical, and cheerful. Gardens are ideal for celebrating your special day in a stimulating and beautiful location. A garden wedding can be as simple as a backyard wedding, but it can also be elegant and enchanting. Want to plan a garden wedding with a whimsical feel? Settle on one color that will use the garden colors as accents. Consider painting clay pots with colorful designs and demarcate the 'aisle' with these colorful pots. Filled with seedlings or fresh plants, they can also make ideal gifts for the bridal party. The bride may carry a bouquet comprised of flowers found in the garden. For evening or nighttime garden weddings, use tea lights and Christmas lights to decorate the trees and surroundings. This can create a mystical atmosphere. Plan an evening wedding carefully and make sure there are no areas of 'standing water' and place bug attractors (such as sacks with sweet water in them) in discreet locations to cut down on evening time pests. A garden wedding often lends itself to a garden reception. Consider outdoor grilling with cool drinks, picnic tables and pitchers of lemonade, iced tea, or cool water. Plastic, stylized cups may add the right touch of elegance while limiting damage that may occur with glassware. Consider foods with accents of citrus which add to the garden atmosphere. An arch is a great decoration. Garden buildings are ideal locations for either the reception or the wedding ceremony. A gazebo can be decorated with flowers, garlands, ribbons, or lights. A gazebo also places the focus firmly on the bridal couple. Guests may be ranged out in a circle or more traditionally fashioned with two rows of seats framing the sides of an aisle. A trellis or arch may be used to frame the ceremony area if there is no specific building or spot. A trellis can be dressed up with Spanish moss, ivy or fresh or silk flowers, or other wedding arch decorating ideas. Depending on the time of year, choose carefully which fresh flowers to use, particularly roses that may attract bees. When planning a garden wedding, a good wedding idea is to employ live music rather than recorded. Open air is ideal for musical instruments and can add to the whimsical quality of the day. Consider strings (harp, for example) for the wedding march as opposed to the more traditional and deeper playing organ. The live music may be held over for the reception as well. Be sure to provide shaded areas, such as small tents, for the musicians. Include fresh linen on the grass or stone area to provide just the right touch to set the musicians a part from the wedding, but allow them to remain very much a part of the garden atmosphere. Garden wedding ideas are frugal and offer the bride and groom an opportunity to host an elegant, simple wedding without a lot of environmental primping. Gardens are beautiful locations that are prepared to look beautiful no matter the time of year. They provide atmosphere that does not have to be dressed up or removed when the ceremony is over and depending on where the garden is, often available for minimal if any location fee. The key to a garden wedding is to have a back up plan for the weather. If that means a tent or moving the ceremony indoors, be prepared. 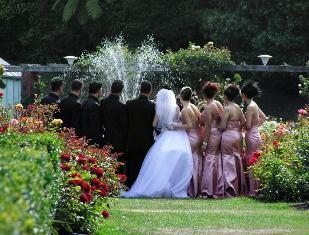 A garden wedding can match any type of atmosphere you desire for your ceremony and reception. From a rustic, whimsical look to an enchanted outdoor evening, consider different garden wedding ideas to make your dreams a reality.